IS GOD HARSH? Does God call on us to mistreat those disfellowshipped for sowing the seeds of discord in God's Church? WHY — yes WHY do some of our brethren feel we are unkind toward those doing Satan's bidding, if we OBEY Christ's following COMMANDMENTS? "In the very beginning of the Church of God, in the first century, there were false apostles, and there were those who went out from the Church for selfish gain or for revenge — even as today." God says, through the apostle Paul, "Now I beseech you, brethren, mark them which cause divisions and offenses contrary to the doctrine which you have learned, and AVOID THEM" (Romans 16:17). Many of you brethren have deliberately DISOBEYED that commandment of God by attending "out of curiosity," a meeting of one disfellowshipped for that very thing! ARE YOU MORE RIGHTEOUS THAN GOD? 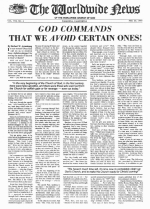 ARE YOU ABOVE GOD, so that you need not heed what he says in the above paragraph? You are going soon, to be called before the judgment seat of JESUS CHRIST. Will you say to His Majesty, "But Lord, I only wanted to hear what he had to say!" WHAT DO YOU THINK THE JUDGE OF ALL THE EARTH WILL SAY BACK TO YOU, who make excuse for DISOBEYING his positive COMMAND? Let's UNDERSTAND this! What doctrine have you learned? Where did you learn the doctrine? Answer? In or through the WORLDWIDE CHURCH OF GOD! How did the Church receive its doctrine — its beliefs — its teachings — when the Church first started, A.D. 31? The Church from the start received its doctrine from the APOSTLES! In our day, Jesus Christ taught His chosen apostle through the written Word of God. The Worldwide Church of God — the same Church as founded in A.D. 31 — received its DOCTRINE through God's chosen Apostles! Now back to Romans 16:17. Why have some leaders had to be disfellowshipped — MARKED? Because of causing divisions and offenses CONTRARY to the doctrine which you have learned! God's Church is UNITED. We are commanded (I Corinthians 1:10) that we must ALL SPEAK THE SAME THING! Those put out were splitting the Church speaking DIFFERENT THINGS! Now notice the next verse: "For they that are such serve not our Lord Jesus Christ, but their own belly, and by good words and fair speeches deceive the hearts of the simple" (Romans 16:18). God's message through Paul, "Now we COMMAND YOU, brethren in the name of our Lord Jesus Christ, that ye withdraw yourselves from every brother that walketh disorderly... And if by any man obey not our word by this epistle, note that man, and have no company with him, that he may be ashamed" (II Thessalonians 3:6,14). Those ministers who have gone out, or been put out, of the Worldwide Church of God, often come to your town or city to speak. Many of them come to you in the form of a tape or cassettes, to preach their perverted doctrine, or to try to turn you AGAINST God's Church — even as they are AGAINST it! They do NOT come to you with the doctrine which JESUS CHRIST put into His one and only Church. WHAT DOES GOD COMMAND YOU? LISTEN, and OBEY! "If there come any unto you, and bring not this doctrine, receive him not into your house, neither bid him God speed" (II John 10). The apostle Paul, speaking to the elders — the ministers — of the Church at Ephesus, said, "Also of your own selves [you MINISTERS] shall men arise speaking perverse things, to draw away disciples after them" (Acts 20:30). Brethren, STUDY THAT! If Paul had said to one of those ministers opposing God's true Church, "You are a minister of SATAN," he would have sharply said back, "I am not a minister of Satan, you are falsely accusing me!" What about these minister who have gone out — or been PUT OUT — from the Worldwide Church of God today? They would be INDIGNANT if I should call them ministers of Satan. They would be ANGRY! They would say, as one was publicly quoted "I let go of coattails, and clasped the hand of Christ!" Yes, they LOUDLY and indignantly say "SATAN COULD NEVER DECEIVE ME!" But Satan has deceived the whole world! "We haven't much time left. It's time now to COMPLETELY CLEAN UP GOD'S CHURCH, and to make His Church READY FOR CHRIST'S COMING!" He had deceived ALL OF US — but thankfully God called some of us, opened our minds to our former ways following Satan and brought us to HIM! Perhaps these ministers now opposing God's TRUTH and HIS CHURCH are themselves now deceived. Perhaps they are sincere — BUT THEY ARE SINCERELY WRONG AND IN THE CLUTCH OF SATAN! Well then, you may say, "Should we not show them KINDNESS and LOVE?" Well, should Christ himself show kindness and love toward Satan? These people, even if sincere and deceived, are in SATAN'S service doing what SATAN WANTS DONE — helping Satan try to DESTROY God's one and only TRUE CHURCH! Let's not REASON our way to DISOBEY GOD! God COMMANDS "AVOID THEM!" "AVOID THEM" does not mean to go hear them out of curiosity! You who do that are DISOBEYING GOD. You are trying to be more righteous than GOD! Now brethren, we have not wanted to act harshly. If we follow God's instructions strictly we should DISFELLOWSHIP and MARK you who go to hear these ministers, or listen to their tapes or cassettes. PLEASE DO NOT MAKE US DO THAT BY YOUR CONTINUED DISOBEDIENCE and continued going to hear them or hear their recorded messages which are AGAINST Christ's CHURCH, and therefore AGAINST CHRIST! But there is GOVERNMENT in God's CHURCH. Just as there shall be GOVERNMENT in the Kingdom of God. It is the same government now in the Church — based on LOVE — but do not mistake GOD'S LOVE, and DISOBEY HIM! God says of them through Peter "Which have forsaken the right way, and are gone astray, following the way of Balaam who loved the wages of unrighteousness. These are wells without water, clouds that are carried with a tempest, to whom the mist of darkness is reserved for ever. For when they speak great swelling words of vanity, they allure through the lusts of the flesh, through much wantonness, those that were clean escaped from them who live in error. While they promise them liberty [as some of these very former ministers did when they secretly prepared and distributed to the ministry the "STP"] they themselves are the servants of corruption. For if after they have escaped the pollutions of the world [as these former ministers did when first in God's Church] through the knowledge of the Lord and Savior Jesus Christ, they are again entangled therein, and overcome, the latter end is worse with them than the beginning (II Peter 2:15-20). Through Jude GOD says: "Woe unto them! for they have gone in the way of Cain, and ran greedily after the error of Balaam for reward, and perished in the gainsaying of Core" (Jude 11) What was the gainsaying of Core? This is spelled Korah in the Old Testament. Read of it in Numbers 16. Korah led a group to challenge Moses, whom GOD had chosen to be the LEADER over Israel. For opposing the one GOD chose to lead His people, God had the earth open and swallowed them up. Yet men today oppose Christ's chosen apostle! Brethren, if I as Christ's apostle COMMAND YOU not to go to hear one of these or to receive one of his tape or cassette into your home, WHAT WOULD YOU THINK? Would you be angry at me? Well, that is PRECISELY WHAT GOD COMMANDS YOU. Are you angry with HIM? Some of you have been disobeying Him! Are we a COMMANDMENT KEEPING CHURCH? If we are, then let's OBEY. If you DON'T obey God or Jesus Christ, YOU ARE RIGHT NOW BEING JUDGED. IT IS JUST THAT SERIOUS. And it's time we all begin to take it seriously. Some of you do not seem to know just who have been disfellowshipped — marked — or PUT OUT of God's Church. Below is a list. We love them, God loves them — but He COMMANDS US TO AVOID THEM — because they were causing division, harming God's CHURCH — and God loves His Church TOO!